Many OS X users know the productivity tool Alfred. Alfred is far more than a quick launcher that will let you operate your computer with the use of your keyboard. 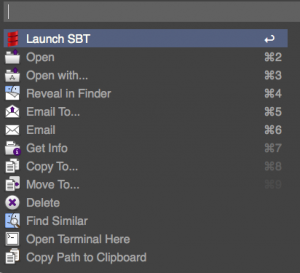 Recently I created a very simple workflow, that adds a file action to *.sbt files. It will open the directory in Terminal and launch the Scala Build Tool. Just select the build.xbt file in Finder and hit CMD+OPT+\ to launch the file actions window of Alfred. 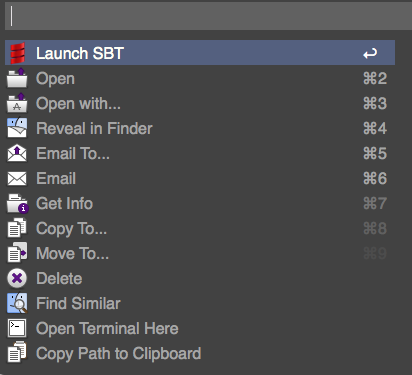 It will show the option ‘ Launch SBT’. Even better, it also works from the Eclipse Scala-IDE. You can download the workflow here. This entry was posted in Scala and tagged Alfred, SBT, Scala, workflow. Bookmark the permalink.